What a week for Fife! Fire Station Creative are delighted to announce that Scotland's newest creative hub in Dunfermline, Fife, will be opened by John Byrne at a celebration on Friday 10 July. This brand new facility is the product of years of voluntary work by a small group of like-minded people. The result is the recent renovation of a former fire station, which had been lying empty for five years, a listed building on the 'at risk register'. The building was originally designed and built by a local architect James Shearer in 1934. It is currently owned by Fife Council, which has agreed to rent it at a peppercorn rate. The Fire Station has served its people well over the years. The energy and admiration is alive in the building to this day. 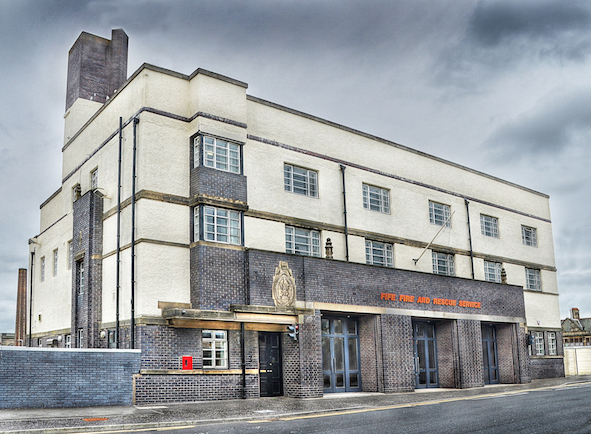 Fire Station Creative is a charity and social enterprise that was set up to renovate the building and operate it as a creative hub. Dunfermline is a fast growing city with a population of 79,000 but limited cultural facilities. There is a vibrant creative community here but many of its members go elsewhere to work and seldom return. The facility provides 21 studio spaces, a classroom, a gallery and a café aiming to support creative people at every step of their journey as well as inspire the younger creative community. The studios are already fully booked and artists are moving in and setting up their working spaces. They include a variety of disciplines at a range of stages in their career – painters, print makers, photographers, graphic designers, upholsterer, jewellers, tailors and conceptual artists – students and established professionals. There is a studio dedicated to art therapy where local therapy groups can access a space free of charge and offer their clients a consistent and community based venue to work from. There is a classroom which will be rented out by the hour and offer drawing and painting classes alongside design and craft classes for adults and children. The space can also be used for smaller exhibitions or events. The jewel in the crown is the gallery which has been created in the Engine Room. The metal roller screens have been replaced by glazed panelled doors, massive moveable walls have been built to display art works. The ambition is to host around eight exhibitions a year, of mixed genre, aiming to inspire the viewers and offer them a creative experience that is currently unavailable in Dunfermline. The inaugural exhibition is by Gordon Picken has been described as one of the best painters working in Scotland today. Work by local artists will be exhibited in the café area. There's a small shop offering works by local artists and designers from cards and prints to artworks and jewellery. 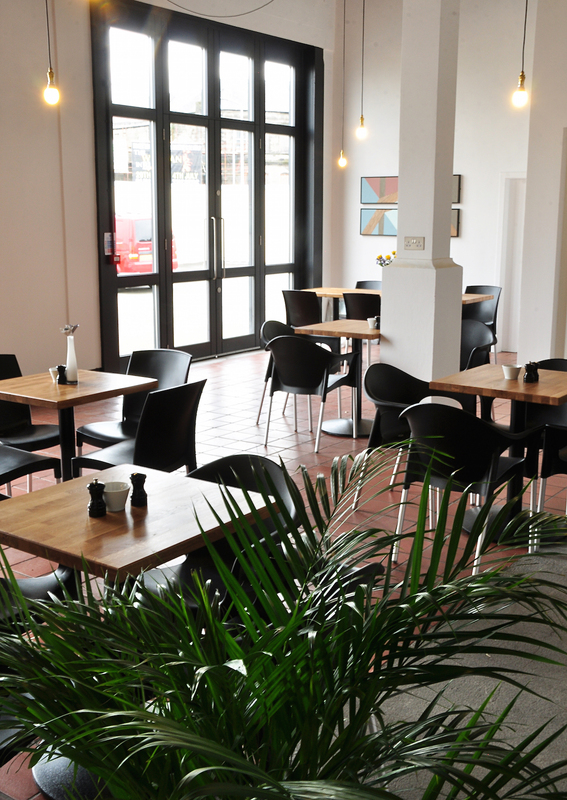 And finally the café has been set up with the ambition of celebrating the art of food. 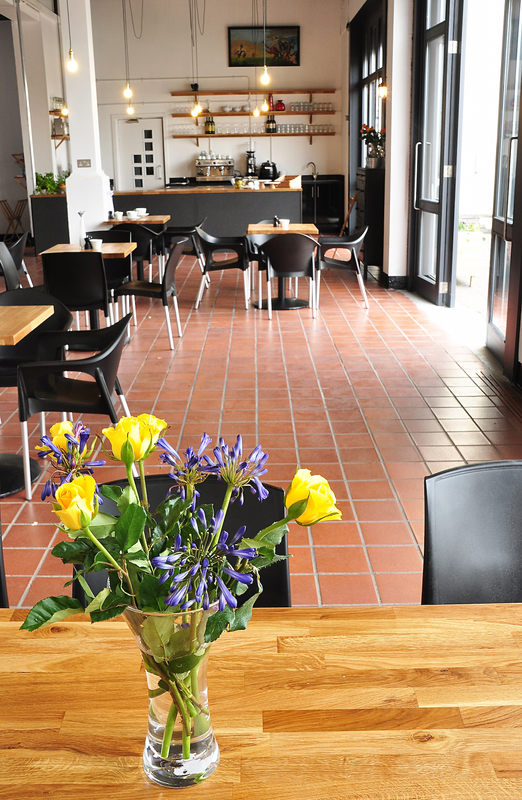 Coffees, cakes, lunches and events will be catered from here with specials, supper clubs and tasting menus at various opportunities. 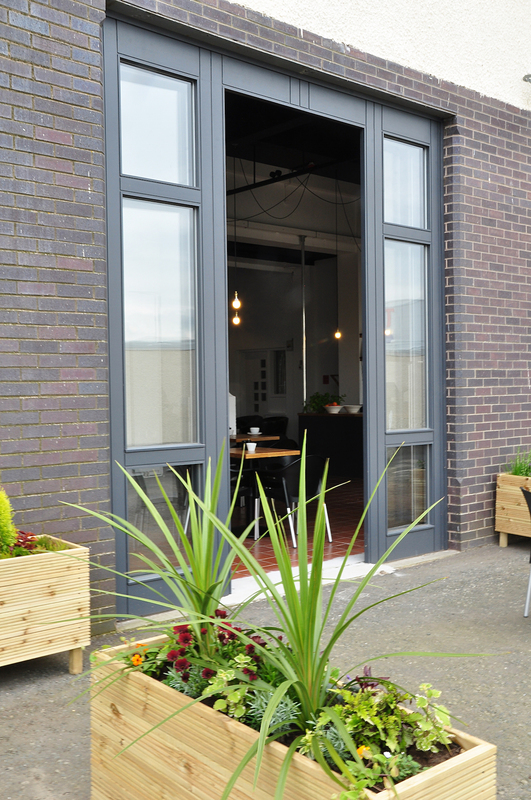 The café opens onto a large yard with outdoor seating and evening sun. Here's hoping for an inspiring summer! The renovations and conversion of the building would not have been possible without the support and sponsorship by seven key organisations; Fife Council, Creative Scotland, The Robertson Trust, Fife Environment Trust, the Barcaple Foundation, Community Union and the Educational Institute of Scotland. Cllr Helen Law, Chairperson for the City of Dunfermline Area Committee welcomed this new and innovative offering to the town centre. Cllr Law says "Fife Council is please that after a lot of work by Fire Station Creative working in partnership with Fife Council we are about to open the doors of what I hope and believe will be a very important addition to out town centre. The group are to be commended for their efforts in bringing this project to fruition and I'm sure that through time this facility will provide a much needed shot in the arm for our town centre"
David Taylor, Head of Strategic Projects, Creative Scotland, said "We are delighted to be able to support this project that will see Dunfermline's distinctive old Fire Station is being renovated to become a cultural hub. This will provide artists and creative practitioners access to the best possible facilities in Dunfermline. As well as creating a vibrant space for artists, it will increase access for the local community, and contribute to the on-going vibrancy of the town centre."